This blog is dedicated to His Divine Grace A.C. Bhaktivedanta Swami Prabhupada. 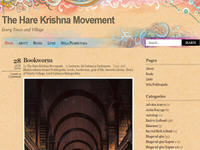 It will explore the news and issues inside The Hare Krishna Movement as established by Srila Prabhupada. Category Blogs July 3, 2012 by ISKCON Desire Tree.